Worried about a rash of break-ins in her low-income neighborhood, Jacquie Simms and her husband took what seemed to be the logical step: installing a home burglar alarm. She knew neighbors ignored the blaring sirens, assuming they were false, but she slept better knowing police were paying attention. "The community has become desensitized to alarms," said Simms, 54. "Still, you expect the police to come if the alarm sounds." But with about 95 percent of the nation's 38 million yearly alarms turning out to be false, according to a national police group, authorities increasingly aren't coming when a siren sounds. The LAPD is poised to join nine large other police departments nationwide - including Baltimore, Las Vegas and Salt Lake City - that do not respond to alarms unverified by a private security guard, a surveillance camera or a resident. Proponents argue that such policies quicken police response time to real emergencies - and save money. Opponents claim the policies target low-income homeowners who rely on burglar alarms for their safety. In Los Angeles, about 92 percent of the 136,000 burglar alarm calls last year were false, costing the city $11 million in lost patrol time, said Joe Gunn, executive director of the city Police Commission. "Over the years, alarm owners had a false sense of security," Gunn said. Nationwide, false alarms cost police agencies $600 million a year and use up 6.5 million personnel hours, according to the International Association of Chiefs of Police. A 2002 Justice Department study put the price tag nationwide at $1.5 billion. Even without a formal policy, police in Los Angeles, Chicago, New York and dozens of other cities place alarm calls at a low priority, meaning officers may not arrive for up to an hour or more. Gunn said a verified alarm would be answered as a high-priority call, with a response time in minutes, not hours. Panic alarms - activated by residents inside their homes - continue to be handled as priority calls under most of the new alarm policies. Eighty-six other cities are considering changing their response policies, said Shanna Werner, the alarm administrator with the Salt Lake City Police Department. "Police have struggled with false alarms for 30 years," she said. "Verified response seems to be the answer." The new LAPD policy officially takes effect Tuesday, although police plan to give residents two-and-a-half months' notice, using the time to retrain dispatchers. The alarm industry is trying to head off the change in court. A hearing on its lawsuit is set for May 6. "If Los Angeles does it, then everybody is going to do it," said Lessing Gold, a lawyer for the Greater Los Angeles Security Alarm Association, which filed the lawsuit. "If they back off it ... then other cities are going to do the same." Alarm industry lawyers claim the policy change means low-income alarm owners will have to pay more to have a security guard respond to their alarms, or to add surveillance cameras. "We have a lot of single, senior citizen ladies who live alone. 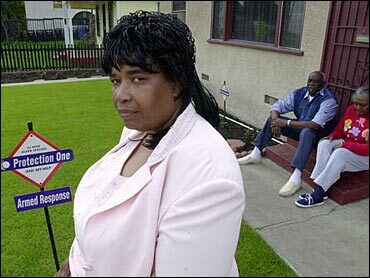 They're lucky to afford an alarm; they rely on it for safety," said Simms, who heads a neighborhood council in Watts. "They can't afford to pay any more for a guard." Industry experts said monthly bills in Los Angeles could rise by $15 to $30 to cover monitoring by private guards. The monthly service fee rose by $5 in Salt Lake City after its policy change. The changes come as ownership of alarm systems grows at a rate of 1.5 million a year, according to industry estimates. Installation is often free, with customers paying an average $30 monthly fee for monitoring. In most cases, monitoring means a phone call from the alarm company to a customer when an alarm is activated. If no one answers, the company notifies police. Instead of blanket no-response policies, police agencies should target the few alarm companies responsible for the majority of the false alarms, said George Gunning, vice president of the National Burglar and Fire Alarm Association. "Most of the false alarms come from repeat offenders," he said. He said a program adopted in 2000 by police in Charlotte, N.C., holds homeowners and alarm companies responsible for false alarms. Calls dropped from 106,061 in 1995 to 66,000 in 2002; the number of alarms linked to actual break-ins remained at around 1,300.